Finest City Wrestling is Back this Saturday at the IB Boys and Girls Club! Get your Tickets Now! Finest City Wrestling is Back this Saturday! Doors open at 7pm, Pre-Show 7:30pm & Bell Rings at 8pm at. IB Boys & Girls Club of South County, 847 Encina Avenue. Imperial Beach CA 91932. 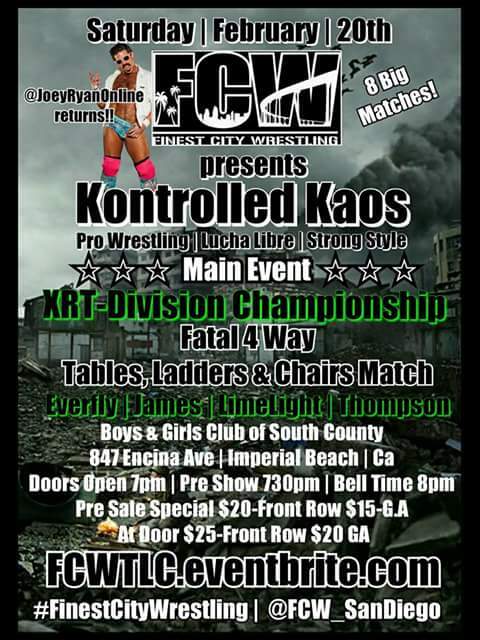 This Saturday at the Imperial Beach site, FCW is back again to showcase some of the best talent of wrestlers, with our Main Event being a fatal 4 way TLC Match (Tables, Ladders and chairs!) for the XRT Championship belt! Doors open at 7p on Saturday, February 20th!